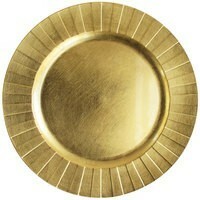 ChargeIt by Jay Gold Banded Rim Round Melamine Charger Plate 13"
7% off sitewide! Use code CHARGER7. No exclusions. Home > Products > ChargeIt by Jay Gold Banded Rim Round Melamine Charger Plate 13"
The ChargeIt by Jay Gold Banded Rim Round Melamine Charger Plate 13" is a stunning addition to any dinnerware collection. Featuring mesmerizing gold band detailing along its rim, this charger plate provides a striking backdrop perfect for layering with white ceramics. Ideal for wedding receptions, lavish parties, and other high-end events, this premium quality melamine charger combines a delicate look with exceptional durability. The perfect harmony of beauty and form, this charger is not only a beautiful serving piece for your dinner table but also provides protection against spills and mess. To properly care for and maintain this charger plate, hand washing is highly recommended. Copyright © JustChargerPlates.com 2019. All rights reserved. We strive to keep prices low, provide true customer service, and deliver top quality products through fast shipping.